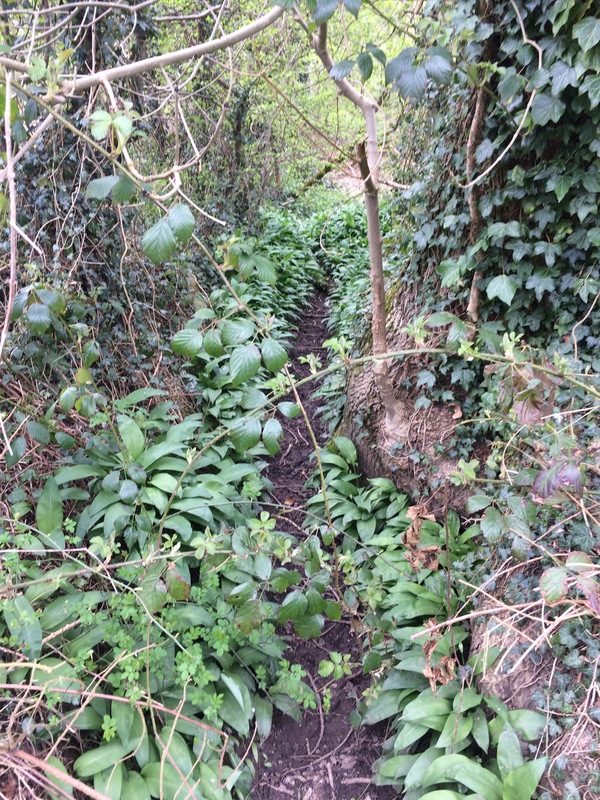 You may find some lovely Wild Garlic! It is beautifully in season at the moment and in abundance! I first became a fan of wild garlic last year, when I found a little bunch of it on a walk that I took with my two dogs, Ce Ce and Mi-Mi. I picked a few leaves and the aroma of garlic drifted up to my nose! I’ve been hooked ever since that encounter and I have been eagerly awaiting the return of this foragers delight! A few weeks ago my partner and I decided to try a new local walking route (a change is always good! ), the dogs loved it and I must admit my partner and I were smitten. A brook runs next to the path which is sheltered by trees of blossom and birch. It’s a peaceful walk where we can let the dogs off and they can enjoy themselves. 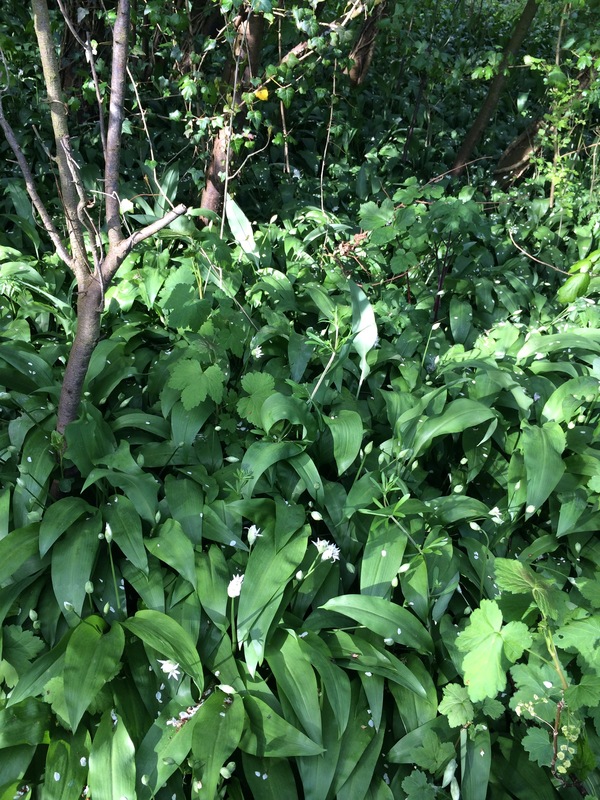 Whilst walking there it wasn’t long until I saw the familiar sights of the wild garlic leaves and scooped some up. I’d recently seen some recipes in the Good Food magazine using Wild Garlic and also a Wild Garlic Pesto on the internet, which I had been eager to try! Once home with my foraging finds I set to work making a few things. I love pesto and at the moment we have been having a lot of salads at lunch time, so I thought the Pesto would be a lovely extra on a nice salad! 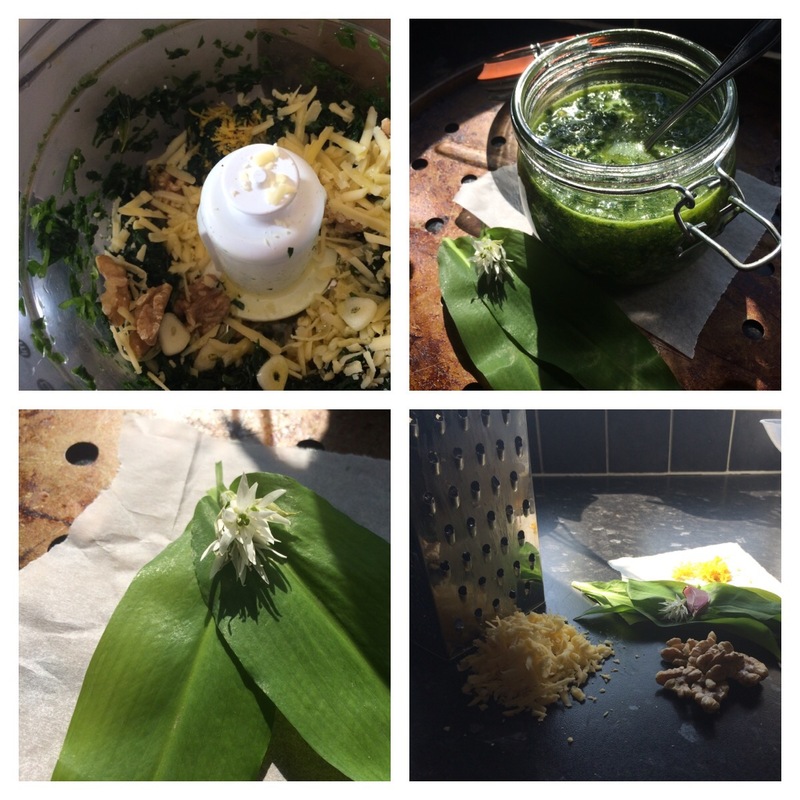 I found a great recipe from Tom Kerridge for a Wild Garlic Pesto, which is the one I made! I must say it’s very good and I thought it was simple to make! With the leaves in the food processor also add the garlic, nuts, olive oil, lemon zest and grated parmesan to the food processor and blend. Season with salt and pepper. And hey pesto! It’s that simple! I put mine in a glass storage jar and once cool I kept it in the fridge. I cant tell you how nice it tastes and I’ve used it on and in so many things! 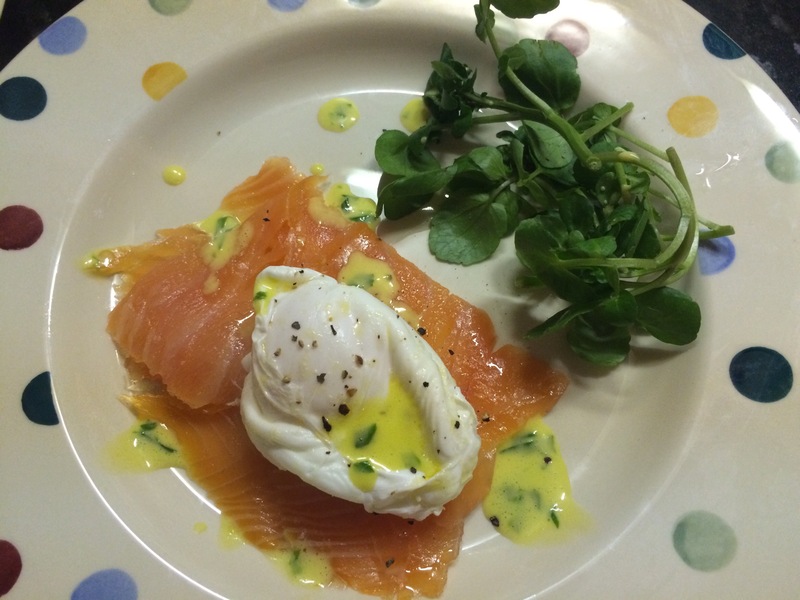 I was also making a Hollandaise sauce for a starter, which I added some wild garlic to as well! Wow! It was amazing! I definitely urge you to try this if you only try one Wild Garlic recipe! First of all get all your ingredients ready then put your Wild Garlic in the food processor and roughly chop once this has been done add the egg yolks and white wine vinegar. Place the butter in a heat proof dish – I heat my butter for the sauce in the microwave, much quicker and easier! Then keep an eye on your butter in the microwave but make sure you’ve heated it until it’s bubbling away nicely. Add the butter to the Food Processor (the heat of the butter will gently cook the Wild Garlic and the eggs) start the food processor (I have mine on a low setting) then gently drizzle the butter in to the whizzing food processor. Slowly adding the butter will make sure the mixture doesn’t curdle and instead thickens nicely for a lovely finish. Finish with some freshly ground salt and black pepper and enjoy the taste! I’d love to know if you try either of these recipes and what you think! 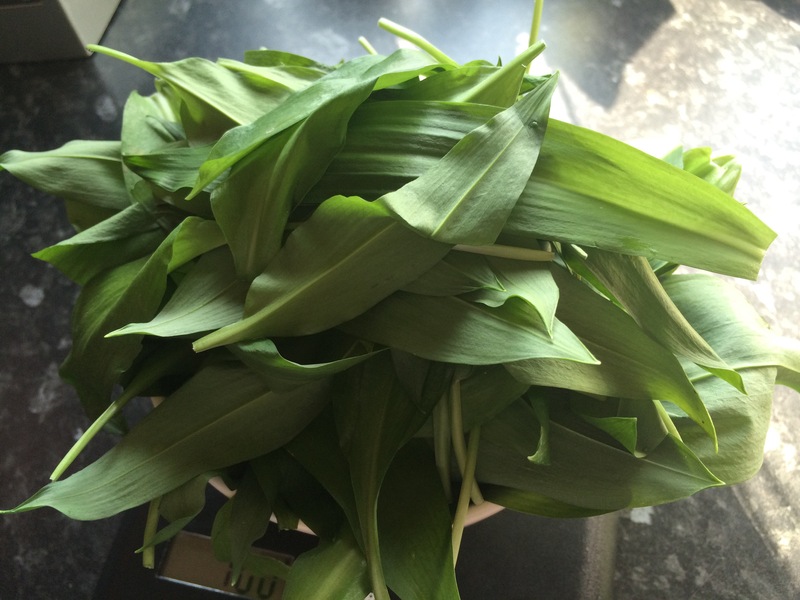 Also if you’ve made any recipes using Wild Garlic please let me know! I’d love to know how you’ve got on! You may have already seen this! Thank you Datz, some very interesting recipes on there! I will give them a go! 🙂 Have you been cooking with wild garlic? What a delicious transformation! Have you discovered Hilda from Along the Grapevine? She is a Canadian blogger specializing on foraging. Homemade Elderflower Cordial – A taste of Summer!